At Gallery 53, we listen to your ideas, needs, and objectives for your artwork or custom mirror and the environment in which it will be displayed, then advise for the best use of framing materials. We use acid-free backing and museum matboard, hand crafted frames, top-quality glass, and premium archival materials at reasonable prices. We carry many beautiful hand-crafted frames and gilded frames, as well as welded steel frames, Lucite boxes, colorful acrylic frames, shadow boxes and custom-made mirrors. The frame mouldings we use are from quality companies such as Roma, Larson-Juhl and AMPF among others. To protect our client’s artwork, we offer several types of glazing, including museum glass and museum Plexiglas, as well as ultraviolet glass and ultraviolet Plexiglas. Our commitment to quality is equaled by our commitment to the environment and sustainable industry. We use only renewable North American hardwoods such as maple, walnut, cherry, mahogany, oak and ash. We also stock frames which reflect the beauty of exotic woods such as padauk, purpleheart and ebony, without the environmental consequences of using rainforest trees. Our services are in-house. We also offer or can arrange for restoration, installation, and pick-up and delivery. 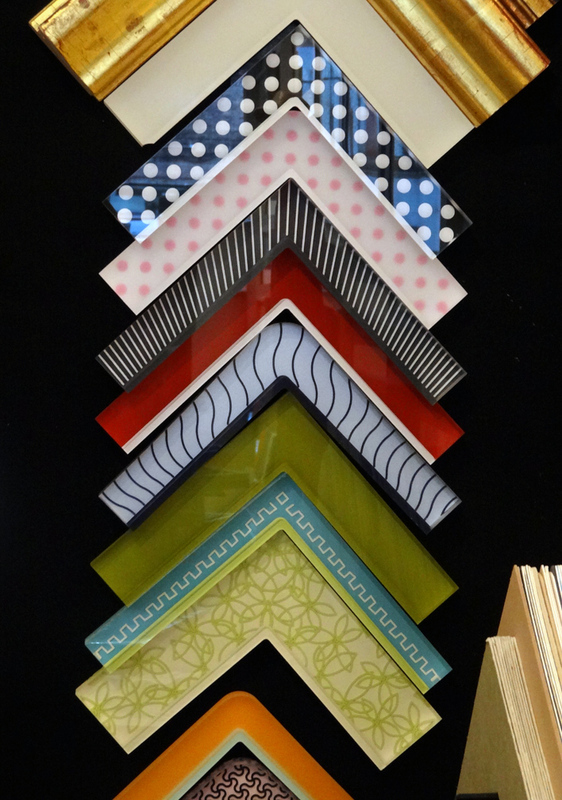 A small selection of our frames are show at left.